Anne Anderson’s story begins when she is diagnosed with breast cancer in July 2013. Her book, “My Journey with Infiltrating Ductile Carcinoma,” goes on to chronicle her daily routine as she starts chemotherapy and experiences the side effects that the treatment presents. For nearly 500 straight days, Anderson keeps a daily record of her diet, activities, pain/comfort levels and the medications and procedures she receives. Anderson’s world soon becomes much more complex when she takes on the role of primary caregiver for both her mother and stepfather. She assumes the duty of managing her ailing parents’ household while undergoing her own radiation treatments and cancer related surgeries. Through it all, Anne Anderson continues to document her daily life from the minute she is awake until she slips into bed at night, providing more than two years of journal entries. Although this book’s format as a daily diary is impressive with nearly 600 individual entries, many of these accounts are cut and dry and provide little of the author’s own thoughts. Despite this, the records are certainly beneficial for someone diagnosed with breast cancer to read through in the face of chemotherapy, surgery and radiation treatments. However, what I find most informative is how Anderson copes with both of her ailing parents in the midst of her own disease. It is in these sections that the author sheds light on her complicated circumstances and how she interacts with others in her community. If you can push past the initial bland entries, you will find that the story evolves into one of a heroic woman who is steadfast in her duty to her parents. On Day 275 she comments, “I just want to make sure that I am here to take care of my parents; however I do not want to stress myself out to the point where I am in the hospital myself.” And, as days 276 to 443 pass, you may wonder how she will manage to keep her own health from disintegrating as she tackles these hefty responsibilities. There are some issues with grammar and the photos that are included in this book. Although I appreciate the author’s intention to document her hair loss, skin condition and provide the reports from pathology and genetic tests, many of the images are blurry, too dark or unreadable. Reworking the editing issues and improving the quality of the supporting materials would greatly enhance this memoir. 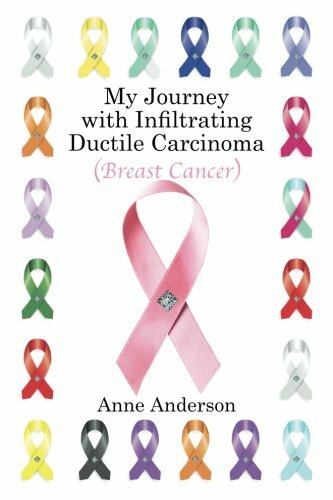 “My Journey with Infiltrating Ductile Carcinoma” provides a daily diary that chronicles the life of Anne Anderson during her diagnosis and treatment of Stage III breast cancer. Although the book records Anderson’s struggle with her health, her own condition takes a backseat to her central role as caregiver to both of her aging parents. I would recommend this book for all those who may be involved in supporting ailing loved ones and for those needing to make decisions involving end of life care.